Designed by SmithGroupJJR over an existing pump station along the Anacostia River, the new building will reinforce the mission of DC Water and feature innovation in sustainable design never before seen in the U.S.
We purposefully designed this building to be a major departure from the boxy architectural forms that dominate the Washington, DC landscape. 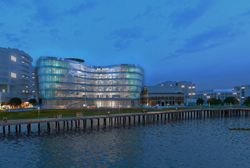 The new $60 million headquarters will be constructed on the site of the existing O Street Pump Station along the waterfront of the Anacostia River in Southeast Washington, DC and serve as the new public face for the agency. DC Water’s green initiatives will be showcased in a deeply innovative facility featuring a bold and distinctive design developed by SmithGroupJJR, in collaboration with builder, Skanska. While the building is designed to achieve LEED Platinum certification from the U.S. Green Building Council, it also employs many advanced strategies that will surpass LEED Platinum certification. Construction of the headquarters is scheduled to be complete in 2017. SmithGroupJJR’s integrated design team of architects, engineers and lighting specialists used sustainable strategies to sculpt the building inside and out. The design team leveraged a series of high-tech daylighting and energy analyses to contour the form of the new building. Its fluid architectural shape wraps around the existing O Street Pump Station, but remains separate allowing full access to the station’s critical operations during and after construction. Solar heat gain and glare are reduced through a unique stepping of the floors. A series of green-tinted glass sun shades hung from the facade provide additional control over daylighting and heat gain. While the curving façade alleviates over-abundant daylighting in the building, it also responds to the bending frontage of the Anacostia River. The headquarters will offer panoramic views of the river, visually connecting occupants to the very essence of DC Water’s mission—water. The design of the building’s heating and cooling system minimizes energy use by incorporating new technologies not yet seen in the U.S. The SmithGroupJJR team is advancing the use of a unique wastewater thermal system, cited as the first use of this technology in a commercial building in the U.S. This system will allow DC Water to use its own wastewater as a source of thermal energy to condition the building. With two-thirds of all the outflow from DC’s sewers flowing through the underground infrastructure on the site, the system will have a virtually uninterruptible supply of thermal energy. Utilizing this technology, the design team has calculated that the new headquarters will take its place as one of the lowest energy-consuming office buildings in the region. SmithGroupJJR, Washington, DC, is providing architectural design, MEP engineering, and sustainable design services. Other key design team members include landscape architect Oehme van Sweden (Washington, DC); structural engineer SK&A Engineers, PLLC (Washington, DC); associate architect and associate structural engineer Leuterio Thomas (Oxon Hill, Maryland); associate MEP engineer JVP Engineers, P.C. (Washington, DC); and civil/site engineer Wiles Mensch Corporation (Washington, DC). SmithGroupJJR (http://www.smithgroupjjr.com) is a recognized, integrated architecture, engineering and planning firm ranked Top 10 in the U.S. by Building Design + Construction magazine. The firm’s nationally recognized Workplace Practice has completed the planning and design of more than 25 million-square-feet of corporate, government, institutional and private development projects related to workplace environments and urban development. With 150 LEED certified projects, SmithGroupJJR is a leader in sustainable design. The Brock Environmental Center, designed for the Chesapeake Bay Foundation, recently became one of the world’s greenest buildings achieving Living Building Challenge (LBC) certification. Skanska USA is one of the largest, most financially sound construction and development companies in the U.S., serving a broad range of clients including those in transportation, power, industrial, water/wastewater, healthcare, education, sports, data centers, life sciences, aviation and commercial. Headquartered in New York with offices in 31 metro areas, the firm has nearly 11,000 employees committed to being leaders in safety, project execution, sustainability, ethics and people development.